Lesa Walker met with Dr. Kazique Prince (Senior Policy Advisor & Education Coordinator, Office of Austin Mayor Steve Adler) and others on May 27, 2015 to have preliminary discussions. Next steps include working toward a City Resolution. This work is progressing via contacts with the Austin City Council. Ted Ziehe, Bobbie Sanders, and Lesa Walker have met with Mary Dodd, Interim Executive Director of CAN. CAN has created a dashboard of 17 socio-economic indicators which provide an over-view of the social health and well-being of Austin and Travis County. Tracking these 17 indicators over time, in 4 basic areas, this report identifies matters needing the community’s attention and action to improve opportunities and conditions. Lesa Walker has reviewed the CAN data reports and has entered key information on the Trello platform as part of the Compassion Assessment of Austin. Lesa Walker provided a “Citizens Communication” (a brief (3 minute) presentation) to the CAN Board on June 12, 2015 and emphasized the importance of compassion and proposed the development of compassion indicators/measures for Austin. Direct interface with the CAN Community Advisory Board is being sought. Lesa Walker collaborated with Austin “peace” organizations to plan joint celebrations and activities for “Peace Day Austin” (including the days from September 11- 21, 2015 and culminating on September 21st, the International Day of Peace). This has been an exciting opportunity for community creativity and collaboration!! The global Compassion Games are held during this same time. We highlighted Austin’s Peace Day/Week activities as part of the Compassion Games. Lesa Walker has met with Margaret Valenti, Austin’s Neighborhood Contact Team and Education Coordinator and brainstormed ideas for ways to engage neighborhoods In Compassionate Austin action. Thank you to Matt Benoit at Cunningham Elementary for helping with the initial steps of creating the Compassionate Austin website in the Spring, 2015: selecting the website design in WordPress, designing the header image script, and loading the initial content prepared by Compassionate Austin. His work was supported by an Ashoka Innovation grant awarded to Cunningham Elementary (Amy Lloyd, Principal, 2015). Thank you to Jessie Metcalf for the website domain name/initial url financing. As webmaster, Lesa Walker is providing website content, development, and ongoing operation. The Compassionate Austin website was initially published on June 14, 2015. Cunningham Elementary is a recognized Ashoka Changemaker School and a partner school of the Charter for Compassion International. In 2015 Cunningham was awarded an Ashoka Innovation grant to engage Cunningham students in compassionate action to support and promote Compassionate Austin efforts. With the help of the Art Specialist Rylee Frazier, Cunningham Microsociety students (including the school’s “mayor” and “council”) as well as an afterschool project-based art group of students studied, discussed, and learned about compassion and worked to develop the bid specifications for a compassion sculpture for the school grounds. A local artist, Calder Kamin, was commissioned and the “Compassionate Austin” tree sculpture was unveiled at the school’s PTA Color Run and Art Festival on May 16, 2015. The tree sculpture holds pods for recycled materials (found on the school grounds) that birds can use for nesting. The sculpture is interactive, involving the students in creating the nests and also seed balls to hang on the tree. At the Festival students participated in compassion-focused art activities. The tree represents the growing and multiple partnerships in the Compassionate Austin movement. The students are very excited about the sculpture and their contribution to Compassionate Austin. As part of Cunningham’s Microsociety, the school has a “mayor” and “council”. These young students and Cunningham are modeling the culture of a Compassionate Community. These efforts instill in students their sense of self-worth and support lifelong habits of compassion and community service (caring for others, self, and the Earth). Compassionate Austin gave Compassion Award certificates to the students involved and to the school and presented a message of encouragement from Dr. Kazique Prince, Senior Policy Advisor and Education Coordinator, Office of the Mayor. Cunningham Elementary passed the “Compassion Torch” to Becker Elementary to engage students there. Thanks so much to Cunningham Elementary students and special thanks to Rylee Frazier, the Art Specialist at Cunningham, and to Principal Amy Lloyd. Team “Compassionate Austin” participated in the Compassion Games from April 18-26th, 2015. We contributed to the “Love This Place” Story Mapping Challenge as part of the Games! Also, we submitted reports to highlight Austin’s events and activities that showed compassion for the Earth. Even though what we reported just scratched the surface of all the activities and events in Austin, we still helped Austin shine!! Team “Peace Day Austin” and other teams from “Compassionate Austin” had outstanding participation in the global Compassion Games from September 11-21st, 2015. We had 15+ teams! One Austin team, the “9/11 Heroes Run,” a fundraiser for the Travis Manion Foundation, applied for and received a mini-grant from the Compassion Games. 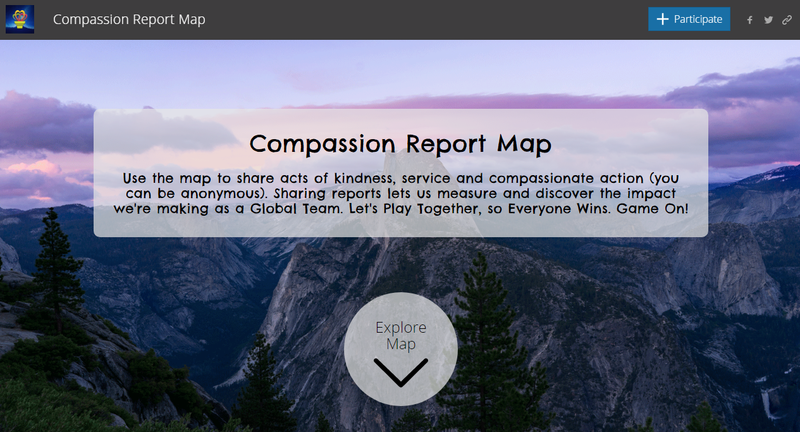 Austin is well represented on the global Compassion Games Report Map! Go to www.compassiongames.org to find out more about the Games! **Since its beginning in August, 2014, Compassionate Austin has participated in all the Compassion Games events: Global Games- 9/2014; Education Games- 10/2014; Interfaith Games- 2/2015; Earth Week Games- 4/2015; Global Games- 9/2015. During the Spring semester, 2015, two University of Texas School of Public Health (UTSPH) Master’s students completed 20+-hour service projects (as part of their coursework) to help inform the Compassion Assessment of Austin. They generated reports and entered their findings on the Trello platform*. Thank you to Scott Kaufmann and Amy Schneider for their work and support of Compassionate Austin! We plan to continue outreach to UTSPH and other Austin-based students to invite participation in the Compassion Assessment of Austin. The Community Advancement Network (CAN) Dashboard is a key compassion assessment tool for Austin-Travis County. We hope to help engage students and others in exploring the CAN data and conducting related research and service projects. *Trello Data Platform- Trello is an online project planning platform we are using to gather, store, and collaborate on information gathered to help inform the Compassion Assessment of Austin. If you are interested in exploring this online platform, please contact Lesa Walker at compassionateaustin@gmail.com. Lesa Walker has had preliminary discussions to explore how Compassionate Austin can interface with Terrazas Library and other Austin Public Libraries. There are exciting possibilities here! Terrazas Library participated in Peace Day Austin 2015 and also the global Compassion Games (September, 2015). Lesa Walker is reaching out to the local artist, Calder Kamin, who did the Compassion Tree sculpture for Cunningham Elementary to brainstorm some creative ways to highlight the “Compassion Tree” and perhaps promote it as a symbol of Compassionate Austin. Lesa Walker has had initial conversations with leadership of Compassionate Dallas/Fort Worth. Collaborations being discussed include a future workshop/conference and an education project. A compassion education project proposal has been jointly developed with the Charter for Compassion International and the Threshold Collaborative and funding is being sought. The project has been discussed with Ashoka and several other key partners. The project would engage youth in story-telling as a way to elevate and use their voice and have impact for positive community (local and global) change. Lesa Walker gave a series of 3 seminars in August, 2015 at Seton Cove here in Austin. The seminar series focused on Compassionate Austin and “3D” Compassion (caring for others, self, and the Earth). Thank you to Mary Berwick for setting up this opportunity. Compassionate Austin is a member of this campaign (which has been nominated for the Nobel Peace Prize). Signing the Charter for Compassion is considered an act of peace. Every time someone from Austin signs the Charter for Compassion, we contribute to the 1 Billion Acts of Peace campaign.